I like Martha. I do. I’m not a huge fan, but I like most of her stuff. It’s just that, back in the day, her stuff used to drive me nuts. Back in the day, when I worked in a craft store, customers would come in and want precisely the products that Martha had used on her show or in her magazine. And we didn’t carry those products because we were a relatively small craft store in Podunk, California. Not back East where Martha was. Which led to very frustrated, and angry, wannabe crafters. Back in the day, her stuff was so complicated, no one – well, no one that I knew – would want to even attempt it. Or so simple, anyone could figure it out. But that was back in the day. If you’re under 40, you probably don’t use ‘back in the day’ too much. I remember when people used to always talk about the good ol’ days. It drove me nuts. I was young. I’m not young anymore. Unless you’re 80. Or even 70. I like hanging out with those gals. I will say this about Martha – she changed after her stint in the slammer. She became more, well, real. Her projects are better too. They’re do-able. Of course, she has a huge creative staff who probably does the majority of them. She is a marketing queen in a king’s world. I admire that. But the stuff on her show? Not so much. Magazines? A little. I like the pictures. So why this discourse on Martha? Because I want to paint a table runner. And I haven’t. So I wanted to find bloggers and crafters who have painted them. I couldn’t find too much out there, which surprised me. Which made me question my sanity. Again. It’s on my daily ‘to-do’ list – questioning my sanity, I mean. You know, I’ve painted on fabric before . . .
. . . like this silk wall hanging, and . . .
. . this broadcloth one. But I haven’t painted a table linens. I keep painting images that I think would be cute on a runner. I painted this last year as a tutorial for CentsationalGirl. But by the time I sent it to her, she had already painted one herself. Kate seems normal to me. I don’t know her, of course, But, she has a great blog, tons of followers, yet she’s not as huge as Martha. So I went on a search to find painted tablecloths & runners. She used stencils for this project. And block stamps for this one. And regular ol’ paint and a paintbrush for these napkins. 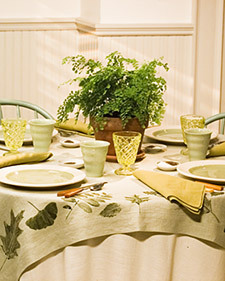 And for this tablecloth, she painted leaves and used them as stamps. 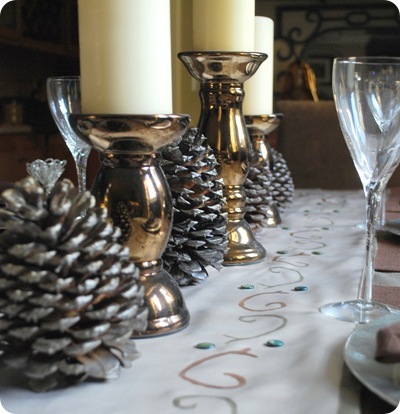 So, I need you to send me some posts of bloggers who have painted table linens. Otherwise, I’ll just have to go ahead and paint the dang thing myself. And question my sanity. Yet again. We lived in Africa for a while and there were tons of intricately painted linens available. I bought several and I LOVE them. I am scared to use them or wash them because I can’t run out and replace them if I need to. But, I display them and really enjoy them! Good luck on your project!